After the December 2015 San Bernardino mass shooting that killed 14 and injured another 22, Moina Shaiq started to question her role as a Muslim. Originally from Pakistan, Shaiq has lived in Fremont since 1987. 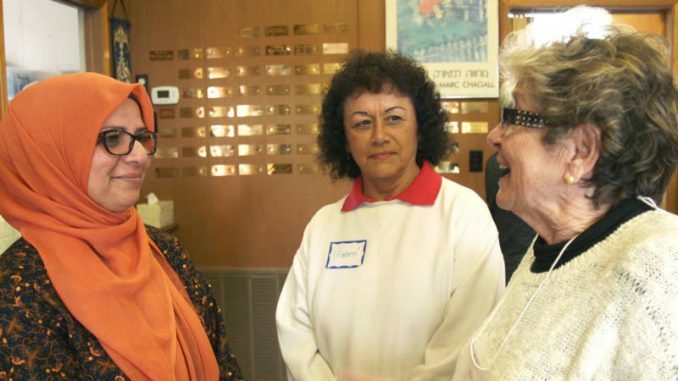 For years, she has been a part of several interfaith groups that connect people from various religions to engage in conversations about their faith. She says that members in her groups had a general understanding of Islam, and she always felt welcome. But after the 2015 attack committed by a married Muslim couple who pledged allegiance to the Islamic State, Shaiq wanted to reach a wider group of people — particularly those without much awareness of her religion. In January 2016, about a month after the San Bernardino shootings, she placed an ad in several newspapers and on social media inviting the general public to come have coffee with her in Fremont as a way to chat and learn more about Islam. She figured maybe a few people would show up. Since then, Shaiq has held about 60 events, mostly in the Bay Area. She’s replaced the coffee shop with trips to synagogues, churches, retirement centers, grade schools and neighborhood associations. She’s even been invited to other states, like Arizona and Massachusetts. Moina Shaiq talks with communities and individuals to combat Islamophobia. She started the work early last year and travels the nation to speak to people who have questions about her faith. Shaiq relies heavily on Facebook to publicize her events. She started a page called “Meet a Muslim,” where she posts event information and photos and videos of herself out in the community. Shaiq says she is on edge whenever a terrorist attack appears in the news. “Today, when anything happens, the first thing that comes to our minds is, ‘Oh God, I hope it’s not a Muslim,” she said. Since President Trump’s election, hate crimes against Muslim-Americans have increased. The president’s controversial travel bans on several Muslim countries has also generated widespread debate. Shaiq says the requests for her to speak has increased after these events, and she now holds at least three talks a week. In the Bay Area, a more liberal audience appear open and accepting. But she is no stranger to people expressing Islamophobic ideas. At one event, a man listened to her speak and left halfway through. Shaiq chased after him and asked why he left. The man said Shaiq did not answer his questions and said he hated Muslims. She invited him to stay and ask his questions. He did, and after the event ended, the man thanked Shaiq for providing a better understanding of the Muslim community. “Those kinds of things make my day and validate the work that I’m doing,” she said with a smile.